I have been reminiscing about my roots lately. Where I come from, where I have been. Where I am going. I am at least a fifth generation Texan, on my father’s side. My family hails from Southern Texas, the likes of Matagorda Bay, Vanderbilt, and Edna. I have many memories of the house on Yuba Dam Street. Stepping onto the concrete steps, the sweet stench of humidity, dust, sweat, and stale vanilla wafers always enveloped me as I crossed the threshold. Newspapers of weeks and months, piled high on the surrounding polyester couches, ruffled in wake of an oscillating fan. I would stare at my Meemaw. She sat directly in front of us, perpendicular, watching a small antenna television across the room. TV trays held Soap Opera Guides, cups of water, and plates of crumbs from the day. Gripping her cane in one hand, and rocking back and forth to gain traction with the other, she would eventually grunt, and in a woof of air, would stand and walk over to me. I was always aware of her ailments, yet Meemaw nevertheless hugged me tight. I was named for her husband, a blend of alcoholism and emotional anger, sweetness, and cruel frailty. I was also born on his birthday, a few years after his death, and must have been a consistent reminder of her difficult life with him, although she never showed it. Meemaw loved all of her grandchildren a great deal. Soon after we would arrive for a weekend, a closet would open, and presents commenced: a crocheted pink afghan for my dolls, grocery store perfumes, and clearance costume jewelry. Looking back, it is easy to see that my grandmother was a hoarder, but I expect nothing less from those raised in the Depression, with memories of belly aches and longing. Her bedroom was lined with bookcases, and filled with newspapers, sheets, dusty antique bottles, collectible ceramics, picture frames, and SAS shoes. Meemaw’s extra bedrooms were playgrounds for little girls, with plastic dolls, blankets, cribs, and figurines from the 1950s. At night, we would sleep with the windows open, as to be awakened by chirping birds and to be stifled by the humid heat. The only air conditioners were in her bedroom and the living room. My love of pimento cheese stemmed from her kitchen, as well as SPAM, vegetable soup, and store bought shortbread cookies. She bought thick sliced ham, and Velveeta block cheese, and we would eat white bread sandwiches with mustard while watching General Hospital or Hee Haw. Meemaw took me to watch The Best Little Whorehouse in Texas for the first time. There were several buildings outside, one where she kept canned goods like pickles, peaches, and beans. Another my Papa used when he was alive, and contained his carpentry tools, old hammers and saws, and I had heard at one time even a cow. Some local thug took the liberty of tagging it, but I still dream of my namesake there. I often see him, a skinny image, watching over me at night, in a stingy brim hat, in gray pants and a white shirt. Maybe I am dreaming…. We moved away when I was 13, and returned when I was 17. Meemaw died that summer, just a few weeks after we returned home to Texas. We had only visited one time that year. While I never got to say goodbye, my heart still holds much love for all she was. My daughter now uses that pink afghan blanket for her dolls. 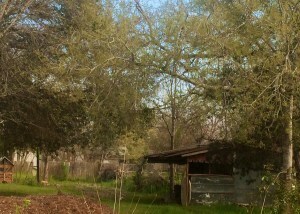 I drove by the house on Yuba Dam Street recently. 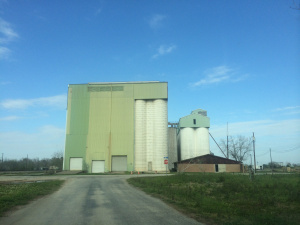 The grain elevator is still in working order at the end of the road. While a lot of structures are in ruins, her house still remains occupied… although I imagine barely standing. 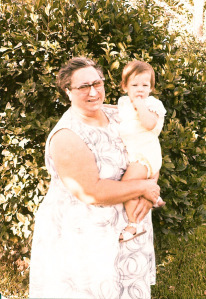 This Spring I tip my glass to Meemaw, one who never drank, who bore the weight of an alcoholic husband, who lived on the brink of poverty, and who raised many children, including my father, who carved his way out of the tiny town of Edna to accomplish much more than many could imagine. Houston’s Karbach Brewery Company prides itself in training in German style, which is perfect; my Meemaw was originally a Frenzel, and often times her smashed potatoes found themselves intertwined with sauerkraut and sausage. 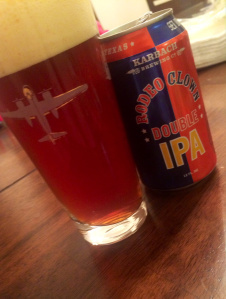 The Rodeo Clown Double IPA is a strong one… just like her. It has 9.5% ABV, an intense, hop flavor, thick head, and aromas of citrus and orange peel. Perfect for a gal like me. Available at HEB for $9. Here’s to remembering our roots. And our branches. Go Local. Go Texan. Cheers. This post is part of a series in the Not So Small Stories hosted by MFA writer and novelist Kirsten Oliphant. Someone close to me recently asked what type of music I listen to. I often hesitate when asked this type of question; what type of music do I listen to when? as I am cleaning? as I sit and watch my daughter, playing in the sand, in the dwindling evening sun? as I stare out the window… surrounded by grapevines, mountains, flowers, and highways? Layers of music have always fascinated me. Definitively, it began with exposure to San Antonio’s Gilded New Wave Age, with bands like Exposure, Depeche Mode, and The Cure fostering my early listening habits. Of course the mainstream songs like Give A Little Respect and Just Like Heaven made proud announcements into my cassette player, but Oh La’Amour really stole my heart, with its electronic beats marching into my mind, stratums of harmony circling my heart, creating footpaths into verse my soul could understand. Of course none of us actually believed these boys loved us, right? Let’s just agree that I really needed a Panasonic Keyboard. In high school we moved to Ohio, and while surrounded by cornfields and pig farms, I discovered The Steve Miller Band, Rush, and Pink Floyd. Bonfire playgrounds, small circles, and a short stint in marching band built the stage for my formative musical imagination. Sitting in my high school boyfriend’s restored 1984 Ford F-150, looking up at the starry night sky, autumn winds blowing through the trees, I thought I could tell heaven from hell, blue skies from pain, and green fields from a cold steel rail. Tiers of notes would pile into my awareness, like rapid beams of thought that knew no boundaries, firing into the heavens, riding on structures made of steel guitar, piano organs, and cymbals. The beauty in my ears matched the beauty of the forests that surrounded us. I was changed forever in those times. Eventually, these musical phantoms turned to Coldplay, Jet, Kings of Leon (before they were On Fire), and Guster. I still sing loudest in my car to “I Spy”… not only because I remember the May Parades… but because I’m also so damn tired, don’t know how far I’ve gone, or recognize who I’ve become… at times. In more recent days, my stereo has blasted everything from The Knife, Phantogram, Naked and Famous, and Passion Pit… to Of Monsters and Men, Peter Bjorn and John, and Shout Out Louds. When feeling especially amorous, usually within sights of mountains, valleys, grapevines, and clear skies… I bust out Beirut, close my eyes, and feel the vintage style of Italy. Even in Texas you can feel this particular musical voyage, as you drive North from San Marcos to Driftwood, where the vineyards of Duchman Family Winery sweetly sing from the fields around you. The trumpets and stringed guitars play in harmony. A pillar of Texas Terroir, Duchman only uses 100% Texas grapes, a feat only a few wineries here can claim. One of my favorite varietals is Vermentino, a grape typically grown in clay-soiled, humid areas like Sardinia, Corsica, and Piedmont. 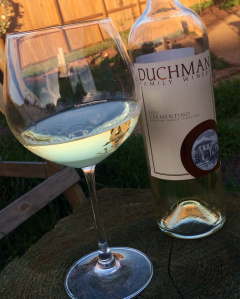 With fresh citrus and light florals on the nose, Duchman Family Vermentino is light, slightly aromatic, and bright. The palate recognizes faint lime, with invigorating acidity and subtle minerality on the finish. It’s a perfect wine for sipping outdoors during the new Spring, and available at Whole Foods, Central Market, and Specs, for about $20. Sitting on the back porch, breathing in the bright winds, there is no other place I’d rather be. Oh, how I wish you were here. With trumpets. And string guitar. Go Texan. Cheers.